So what do you call something that far exceeds your expectations into a whole new realm of awesomeness? I call it Team Elise Night at Chick-fil-a. Tracy Matlock and the Southlake Chick-fil-a went above and beyond for us and I am so thankful for their support. Even more amazing is the number of friends that came out to "Eat Mor Chikin" with us. Some people drove 45 minutes to come see us. Some I hadn't seen in almost three years. Everybody came out eager to eat some good food and support a worthy cause while they were at it. At last count I think we had over 120 friends (kids and adults) come join us. And that's not counting friends that went through the drive-thru, or friends of friends. I'm not sure on the exact total of what was raised, but we should have that number in the next few days. Me: Did you have fun last night with all your friends at Chick-fil-a? Elise: Yeah... I loved all the people. Why so many people come to play with me? Me: Well... I'd have so say it's because they love you... you are one very loved little girl, did you know that? Here are some fun pictures we took of the event... enjoy! It's hard being a first-time parent, even though it's something we (meaning those of us that make the plunge into parenting) must go through. Basically, you have to learn everything on the fly. Sure you have your ideas of how you want to parent, but when you add one little, but very distinct personality to the mix, those plans can go right out the window. Now, add diabetes on top of it all, and it can be downright impossible. I'm talking about having to discipline your kids. This may come as a surprise to you, but Elise is not the amazingly sweet, wonderful angel I make her out to be. Oh no, she has way too much of her Momma in her for that. And lately we have noticed that along with a couple of inches, Elise has grown a wee bit of an attitude to match. People have told us all about the terrible threes, and I'm sure this is what we're dealing with when we hear her yell "no!" at us, or she doesn't listen, or the tantrums, the not sharing, the refusing to do what she's told... man, did my two year old skip a bunch of years and turn into a teenager when I wasn't looking? Should I hide my car keys and lock up the liquor? The problem, as all you D-parents can attest to, is sometimes it's hard to tell if it's a "typical-toddler" issue, or a "diabetes" issue. Is her bad behavior because of a low or high BG? And how am I supposed to discipline her when I have to test her BG to rule it out? By the time I've done that, we've lost our "teachable moment". -Discipline child (for us, the first step is a time out, after a warning of course). -Explain to child why what they did was wrong, why they were punished, and how they can make a better choice next time. -Hug it out and go on your merry way. -Now why the hell was I checking her in the first place??? Okay, that may be a little exaggerated, but you get the idea. Another thing I hate is how Elise has learned to use her diabetes as a stalling tactic, or when she's looking for attention. This usually comes into play at bedtime, when she'll tell us her tummy hurts, or that she's hungry (for her, these are signs of a low). She fully understands that this means we'll need to check her BG, and she'll possibly get a snack. With the introduction of Eileen, we can now show her that she's okay... but it doesn't stop her from trying. I've tried to explain to her that she shouldn't say these things if they're not true (I've even read The Little Boy who Cried Wolf... she didn't get the parallel), but of course I'm not going to punish her for it. The last thing I want is for her to not tell me something because she's afraid of getting in trouble. All in all, I'd have to say we are pretty lucky... despite having a strong personality, Elise is pretty quick to listen, and we usually don't have to go past the "warning" stage with her. But I am feeling pretty beaten down trying to figure all this out. So what do YOU do? How do you handle discipline and diabetes? Come on... help a rookie out and tell me your secrets! Don't Forget to come Eat Mor Chikin with us on Thursday! This Thursday from 6 - 8 pm, the Chick-fil-a in Southlake is doing a fundraiser for Team Elise! 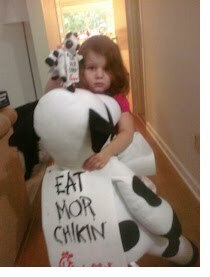 Just come by the restaurant, located at 2301 E Southlake Blvd, Southlake, TX 76092, eat some yummy food, and hang with the cutest little Chick-fil-a fan there is! A percentage from all sales during that time will go to Team Elise, which is already 50+ members strong for this years Walk to Cure Diabetes on September 25th. Speaking of which... have YOU joined yet? Just go to teamelise.com to sign up or make a donation. Thank you so much for all your support! I also wanted to say thank you for all the wonderful comments on my last post. I think I'm better now. Chalk it up to just the right mixture of guilt, pregnancy hormones, self-inflicted perfectionism, and exhaustion. Seeing your child in pain, and knowing that YOU had a hand in it (no matter how accidental) is excruciating. But I learned some lessons and I'm moving on. Your kind words and support mean the world to me, and helped a lot. Apparently, I have a flair for the dramatic when I'm pregnant. With Elise, I fell in the bathtub at 32 weeks and went into labour. I had to say in the hospital for a weekend, but they managed to stop the labour and send me home. This time around, I caught a nasty little stomach bug that, despite my best efforts, dehydrated me severely. When I called my OB's office on Wednesday, they became concerned when they heard I hadn't been able to keep anything in me since Saturday, and told me to go to L&D (labour and delivery) to make sure everything was okay. Upon checking in and being hooked up to various and sundry machines, they discovered my contractions were about 2-3 minutes apart, and I could definitely feel them getting stronger. I was also dilated to a 3, and at 70% effaced. It took 3 shots of Terbutaline, and 3 bags of saline; but they finally stopped the contractions about 7 hours later. As an added bonus, I was also diagnosed with a UTI and reflux. But, I'm at home, taking it easy, and little Mattias gets to cook for a little while longer. One thing I have to mention is that my husband is a complete and total ROCK STAR. He has done an amazing job of looking after both Elise and I. While working from home this morning, he wrangled Elise, managed all her diabetes care, and even cleaned the whole downstairs. All while I slept blissfully upstairs (at least one of the drugs I'm taking knocks me out). What can I say, I married well! It's been a weird, wild and wacky couple of days. Starting with the night my husband fell down the stairs and Elise puked. The next day (Thursday) she woke up at 179. We did everything as we normally would, except about an hour after Elise ate her breakfast, she said she didn't feel so good. Eileen says everything is A-okay in the mid-100s, but a quick finger poke says 132. Did you catch the part where this is one hour post-meal? Yeah, she should be MUCH higher than that. Except she wasn't. I calibrate Eileen and head off to open gym. When we get there, Eileen starts beeping her head off. Quick poke... 48! Crap-on-a-stick! To make a long story short, it takes 33g EXTRA (on top of her 15g snack and 25g lunch) to get her above 80. Her post-lunch number is 108. I give her a pre-nap snack, thank God for Eileen and put Elise down for her nap. Everything is great until right at 3:00, when BAM, her BG shoots up to 310. I guess all those extra carbs caught up to her. Fast forward to today. Elise and I are so, very excited because we're meeting Tracy and Matthew for lunch. Elise wakes up with a bg of 174, and again we do everything as we normally would. About one hour after breakfast, Eileen starts screaming LOW again. Finger poke... 48. Crap-on-a-stick and holy déjà vu! I start stuffing Elise with carbs and head off to lunch after I get her BG up enough. Another long story short... today it takes 50g of extra carbs (on top of lunch and snack), and she never gets any higher than 99 (pre-nap number). Because of what happened yesterday, I'm a bit leery about giving her a snack before her nap, but I do anyway. All is well until I walk into her room to check out her CGM. I notice a smell. A very bad smell. Elise has thrown up all over her bed, and is sleeping in it. Oh. Dear. Lord. At this point she's only been asleep for about 30 minutes, so I do what will surely get me nominated for Worst Mother in the World... I let her continue to sleep in a puddle of her own vomit. My reasoning is this... better she be covered in vomit and well-rested, than covered in vomit and cranky. Right? Can I get a holla? Anyone? All this to say, aside from meeting Tracy and Matthew, it's been a pretty sucktastic day. Elise has been amazing through all of this. The weird thing is, she's not acting sick. She's her usual sunny self. She has no fever, no ketones... just these crazy low blood sugars, throwing up, and just for fun; a few bouts of diarrhea. Thankfully, she has an appetite and will eat and drink, although we've drastically reduced her insulin amounts until whatever this is has run it's course. I'd be remiss if I didn't add how much fun it was to meet Tracy and her AMAZING son Matthew. I was wondering how the dynamic of a 3 year old girl and 9 year old boy would work, but Matthew was so sweet with Elise, and she stuck to him like glue the entire time. I think her hero-worship started when she saw Matthew do his shot at lunch all by himself. Tracy was so much fun to chat with, and I am so glad she made the long drive over my way to meet up. Thanks guys for bringing some fun into an otherwise Terrible, Horrible, No Good, Very Bad Day! Labels: CGM, Eileen, ketones, lows, Sick, what the crap, what??? As Fred is loading the dishwasher, he tells me we are out of dishwasher cleaner. Oh no, there is no way we're going to hand wash those puppies at this late at night. I tell him I'll run to Target to get some and he makes some joke about not making it back anytime soon. Since Target is closing in 20 minutes, I let him know that I will be in, out and home in 15 minutes. I win. Go me. Eileen calls us. Elise is 270 with double arrows up. We scratch our heads and wonder how this can be when all evening she barely made it above 100. We decide to see where things go. One of my many potty breaks of the night. I decide since I'm up to go see what Eileen has to say. Nothing but question marks, something that had happened frequently throughout the day. Gee, thanks Eileen. I check Elise and she's at 144. Eileen still has many questions, so we check Elise again. Crap, 72. With no way of knowing if she's heading up, down or holding steady; we decide to give her some banana. Fred falls down the stairs while going to get the banana. I almost go into labour upon hearing the multiple thuds and following crash. Poor guy, I think he hurt his neck. And I discover I can still move pretty quickly for someone who is 8 months pregnant. Eileen still has nothing to say, but a finger poke shows Elise is coming up and is now at 102. Hello? Eileen? Fine, another poke... 152. Back to sleep for the remaining 3 hours. Heard over the baby monitor: Cough, cough... BLURK! Out of bed and down the hall to discover Elise has thrown up. So we strip the bed, check her temp (normal), check ketones (0.1), BG is fine. She claims that she feels okay, not sick at all. Well that's ONE piece of good news. Thankfully I washed her other sheets, and have a spare to put on the bed. I do not, however, have a spare mattress protector. Fingers are crossed that this is a one time event. Downstairs to put her sheets in the laundry. If you live in the DFW area, here's your chance to eat some YUMMY food, and help support Team Elise! The Chick-fil-a in Southlake is doing a fundraiser for Team Elise on Thursday, August 19 from 6 to 8 PM (a percentage of the proceeds from that two-hour block will go to Team Elise). Fred, Elise and I will be there and would love to have all of our friends in the DFW area join us for dinner at the Chick-fil-A in Southlake at 2301 E Southlake Blvd, Southlake, TX 76092. A big thanks to owner Mark Guilbert and marketing director Tracy Matlock for helping us raise funds to find a cure for diabetes! 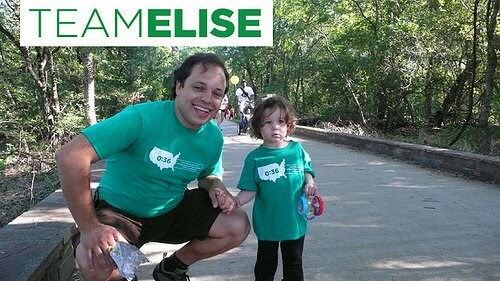 If you haven't already, you can go to teamelise.com to get more information about type 1 diabetes, make a donation or join Team Elise for the 5K JDRF Walk to Cure Diabetes on Saturday, September 25 at 9 AM at Granite Park in Plano, TX . I am so, so happy to report that this second time was way better than the first. Elise handled the insertion like the rock star that she is. And two hours later, we are getting our first set of readings... 170 and holding steady pre-nap. That's what I like to see! Sensor insertion... she didn't even cry! Her prize for doing so well... Belle! To say I'm excited is an understatement. Elise was even pretty pleased about the whole thing. ♫ Eileen I'll hum this tune forever ♫.